Craftster Community > BATH AND BEAUTY > Bath and Beauty: Completed Projects (Moderator: MareMare) > Post your CRAFTY Tattoos! Do you have an awesome crafty tattoo? Maybe it features a sewing machine or an embroidery needle? Post them here and yours just might be the next tattoo on Craftster's Crafty Tattoo Blog Feature! Here's kittykill's fabulous embroidering lady, a past feature on the blog! 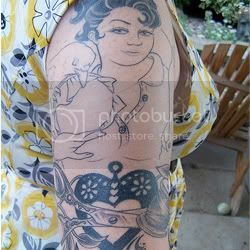 And if you just have an awesome tattoo you want to show off, but you didn't design it, there is a thread in FOC for that! Re: Post your CRAFTY Tattoos! Whee! I can't wait to see all the awesome ink you ladies (and gents) have! Wow, those are great youthgonemild! And I love the paper cranes berdea! Haha, I don't have any tattoo. But i like to see others artful tattoos. My crafty tattoo is a little strange. I have my dog's name "sewn" into my arm. There are also puppy paws and a doggy bone that look sewed on too. Dogs and sewing are a strange combo but I love my dog and I love to sew!